Upon walking onto the terrace at Nepenthe, something catches your eye. 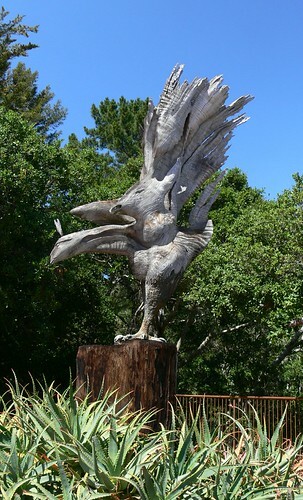 A stately Phoenix bird carved out of a single piece of wood, by Sculptor Edmund Kara, demands to be noticed. At the base of the old oak tree that it is perched upon are, ‘birds of paradise’ planted to add a touch of fire! 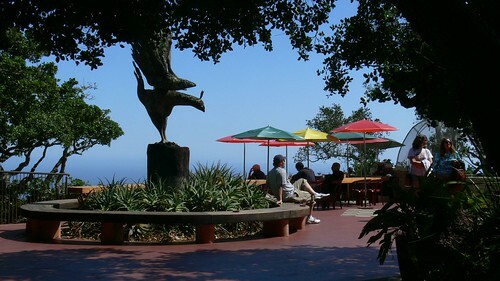 The next, and almost immediate observation is the jaw dropping view of the Santa Lucia Mountains rendezvousing with the Pacific Ocean. 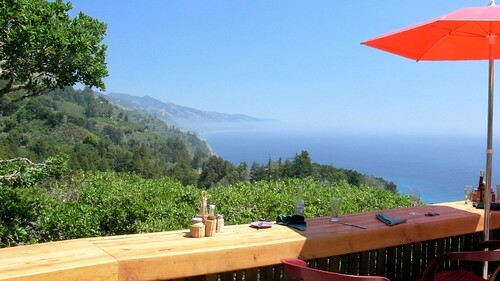 We decided to sit outside to soak up as much of the view as possible before we left Big Sur for good. We didn’t want an entire meal so we just ordered an appetizer. 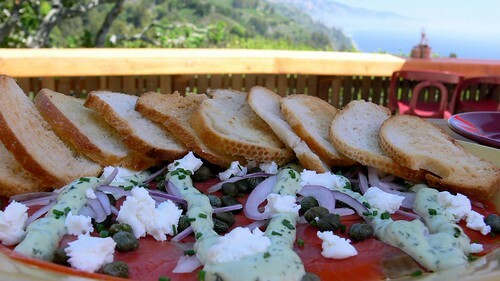 Pictured above is the Cold-smoked Sockeye salmon with basil aioli, crumbled goat cheese, slivered red onions, capers and toasted baguette slices – it was scrumptious! The above photo is a screen shot taken by a friend of Cody’s. 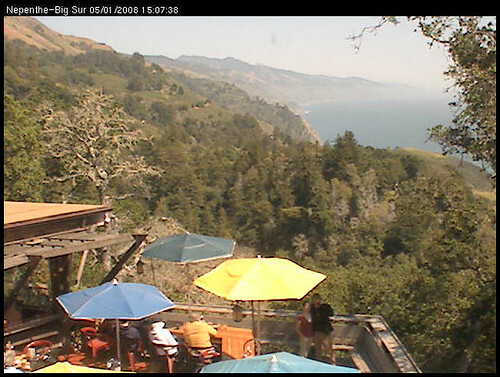 You see, Nepenthe has a weather web cam on their website. During the planning of our trip we visited, quite regularly, the camera page just so we could see the coast and what the weather was like. Before we left I had the bright idea to call someone while we were at Nepenthe so that they could get a screen shot of us on the deck. After trying a few different people we were finally able to get someone who was sitting at a computer! Thankfully, T was kind enough to entertain our little idea – thanks T. You can barely tell that it’s Me & Cody, but it was still cool to see ourselves on the very camera where our dreams began to take form. I’m glad that toward the end of our trip we jumped on the opportunity to stop by Nepenthe. I think we would have regretted not going if we skipped it. Along with the spectacular view, Nepenthe has a lot of history. It opened in April of 1949, and has seen many travelers during its time. I’m glad that we can also say that we have been. Believe it or not, I still have so much more to show you. Nepenthe was one of our last stops in Big Sur, but there is still a lot of in between that I have yet to share. I just like to mix it up a bit – keep you on your toes!?!? Nepenthe says -In Greek, Nepenthe means “isle of no care”. But Wikipedia says – Literally, it means “the one that chases away sorrow”. Depending on how big that phoenix sculpture was, it would have scared the crap out of me! What a view. I wish the east coast had mountains like that. 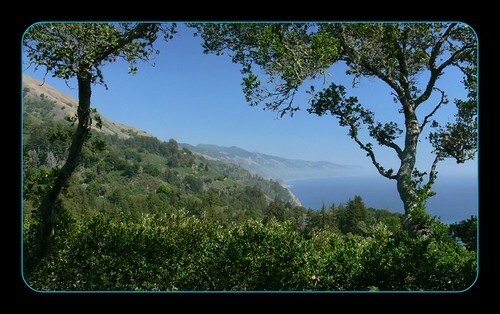 I have to revisit Big Sur after seeing your super pics. The last time we were there we drove through it with 4 month old Robin in the back seat. We loved the views but she just glared at the back of her dad’s head the whole time- very angry to be restrained in the car seat. Oh, Wow! I haven’t dropped by for a few days and what a great way to wrap up my evening: Nepenthe! When I first commented at your blog that I wondered if Nepenthe was still there and you said it was and to stay tuned, little did I know that you’d provide such an awesome reminder of the essence of this place. I am so thrilled to know about the Webcam there, too, and to see that you two prevailed until you were snapped for posterity … oh, so charming. 1218: It was no where near as big as the weird hand thing I saw on your blog…..but it was about 10 foot tall maybe?! greg: Me too, Greg, me too!